One of the things I love about travel is finding interesting sites that make you curious to learn more about something. The John A. Roebling Bridge spanning the Ohio River to connect Cincinnati (Ohio) and Covington (Kentucky) fascinated me from the first time I laid eyes upon it. The stately brick arches, bright blue paint and the sign identifying it as the "John A. Roebling Bridge - 1867" looked a bit incongruous next to the modern riverfront buildings in both cities. The contrast was especially sharp approaching Covington and the ultra-modern Daniel Libeskind luxury residential complex, although The Ascent complex echoed some of the curves and bright blue color of the old bridge. The John A. Roebling Bridge had pedestrian walkways, so it became a must that I walk across the bridge and snap a batch of photos from nearly every imaginable angle! There are a number of bridges spanning the river at this point, but the John A. Roebling Bridge holds several distinctions. The bridge, completed in December of 1866, was the first to span the river and, over 140 years after its opening, still serves as a crossing for pedestrians and vehicular traffic. The bridge served as a prototype for the Brooklyn Bridge, also designed by Roebling and seen to completion by his son, Washington A. Roebling. Washington Roebling also supervised work at the bridge over the Ohio River while his father planned the Brooklyn Bridge project. The decade-plus construction period for the John A. Roebling Bridge also echoes the 14-year effort that it took to complete the Brooklyn Bridge by 1883. I thought again of my walk across the Roebling Bridge as I finished the massive David McCullough book, The Great Bridge: The Epic Story of the Building of the Brooklyn Bridge. It was, after all, the Roebling Bridge that led me to tackle reading McCullough's 562-page book about the building of the famed New York bridge. McCullough's book is a detailed account of the Brooklyn Bridge construction and both Roeblings' part in its design, execution and the fascinatingly gruesome manner in which both bridges claimed the health of father and son. John A. Roebling died after a workplace accident at the Brooklyn Bridge and subsequently contracting lockjaw. Washington A. Roebling experienced years of impaired health after contracting the bends as a result of his work at the Brooklyn Bridge. The book was technical in parts, but offered some interesting insights into bridge construction, technology and politics of the time. 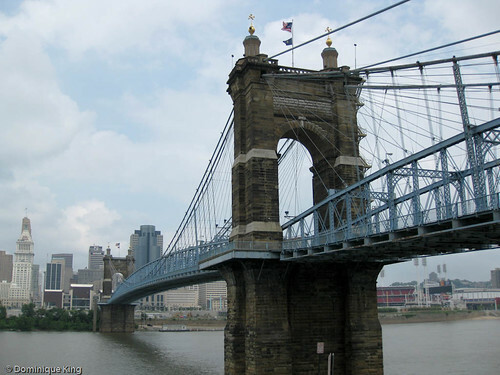 But first, there was the John A. Roebling Bridge between Cincinnati and Covington. Increasing ferry traffic on the Ohio River between Ohio and Kentucky drove the desire for a bridge between the two states. Ferryboat operators and steamboat companies were understandably less than enthused about the bridge proposal. 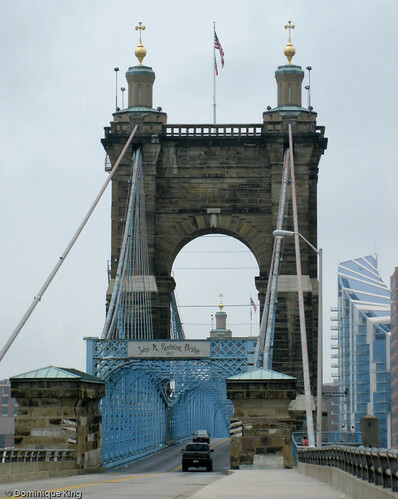 Cincinnati's role as a major Underground Railroad conduit for slaves seeking a safe route north to freedom also led others to oppose the bridge because they felt would ease the journey for escaping slaves. 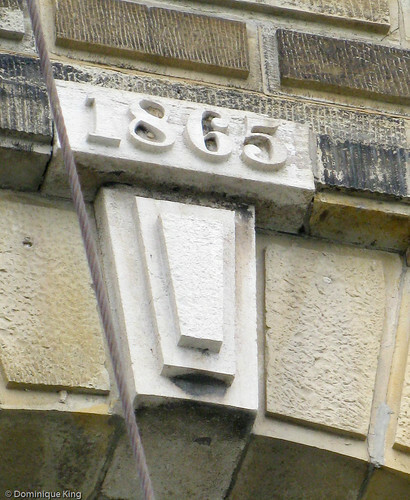 Bridge construction eventually began in September of 1856. Inflation and war caused construction delays throughout the Civil War. The central 1,057-feet span was the longest in the world when the bridge opened to traffic on January 1, 1867. Its larger cousin, the Brooklyn Bridge, became the longest bridge upon its 1883 completion. Be sure to visit look for the Roebling statue and historical marker on the Kentucky side of the river when you visit the John A. Roebling Bridge, as well as the Roebling Murals. 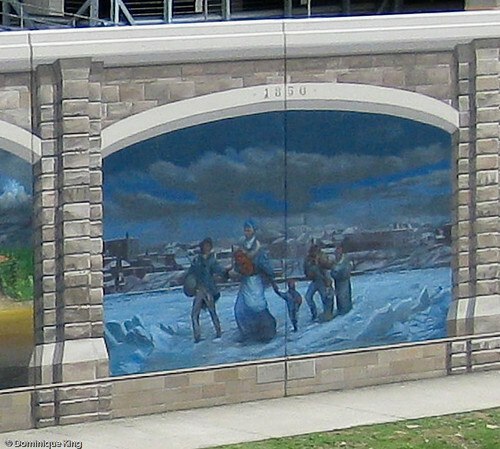 The 18 murals, on the floodwalls near the bridge, represent the largest public art display in the area and depict scenes from Covington, Northern Kentucky and the bridge's history--like this mural "The Flight of the Garner Family". The Garner mural shows the family's 1856 run across the frozen river toward freedom, an event that the murals committee says helped inspire author Toni Morrison as she wrote Beloved. I love bridges. Great pictures--thans for sharing! Angela-Thanks for stopping by! I've got a thing for bridges myself, and this was such an interesting old bridge (still in service)! Very cool when a structure can illustrate history with the story of how it was built, why it was built, and the personal lives of those who built it. I find that so fascinating. Great post! Lora-Thanks! I just knew the bridge would have a cool backstory when I first saw it.